RoyalSpinz casino wishes for all its players to have a royally good fun, and what better way for that to happen – then by simply allowing yourselves to join its amazing program. There are a few things that everybody should know first; like what terms of the service are going to apply here, and how old one must be in order to enter (18+ only). Casino Royal Spinz always knows how to surprise its viewers, and they are definitely going to spend their time gaining as many bonuses as they possibly can. The site is now provided in all of the following languages: English, Spanish, German, French, Finnish, Italian, Norwegian, Russian, and Swedish. Find out what kind of reward you can receive by depositing for the first time, and gain much of the funds required to proceed with the games. Instant support and live help are an important aspect of such experience; available 24/7 and via multiple channels. 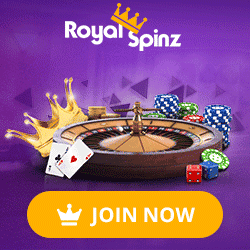 The Royal Spinz casino sure knows how to attract potential clients, who can often learn more about this incredibly resourceful gambling platform, and naturally get to appreciate some of its many wonderful games. With new and features categories like bonus games, video slots, live casino, card and table games – there is no need to wait any longer, but proceed to the lobby full of all the hot new software. Thanks to Fugaso, Mr Slotty, Felix Gaming, Play’n GO, GameArt, Spinomenal, BetSoft, SA Gaming, Booongo, Xplosive, BG, GameScale, Lucky Streak, and Extreme Live Gaming – there will be no lack of proper entertainment either. Get ready to be blown away by the rich colors and astonishing features of slots like Sevens & Fruits, Secret of Nefertiti, Parrots Rock, Sugar Skulls, Age of Caesar, The Mummy, Wild Rodeo, Brave Mongoose, Golden Shot, or Lilith’s Passion. RoyalSpinz accepts a variety of payment methods too, so that customers can choose from a variety of trusted services.